In the Myers-Briggs® community, ISTJs are known for their practicality, their attention to detail, and their serious nature. 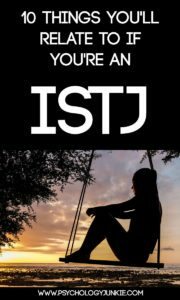 But there’s a lot more to ISTJs than those often talked-about traits. What is it really like to be an ISTJ? How does it really feel to be inside their head? Let’s take a look! Sometimes I notice little things; like a rug that has been moved or a lamp that has a new style of bulb. Other times I notice when someone’s mannerisms change or when they have the most minor variation in body language. Sometimes I surprise people with what I remember about them and how aware I am of differences. Getting riled up about things never helps. I try to stay calm when there’s a disaster and look at the facts and recall what has worked in the past in similar situations. I’m good at keeping my emotions and feelings under control when there’s a problem that needs to be solved. When there’s a problem or a dilemma I can scan my internal database of memories and facts and recall similar situations, experiences, and lessons from my past. I use these experiences and memories to find strategic and practical solutions to the problem at hand. Whenever I learn something new, I store it away carefully in my mind so that I can recall it in the future if it’s ever needed. I think it’s important to have good manners and show respect for others. At the same time, I believe in being authentic as much as possible. I can’t stand it when people are being overly-emotive in a phony, cloying way. I hate it when people use emotional appeals or manipulation to try to get what they want. When people use social niceties or emotional expression to try to get something from someone that’s a major turn-off to me. I also hate it when people beat around the bush or try to spare my feelings instead of just getting to the point and being honest with me. I try to bring results to my work in the most efficient and effective way. I keep my plans organized and I always try to get my tasks done ahead of schedule. I hate procrastination and disorder and I get very frustrated when I see a logical order to things and other people refuse to acknowledge it or see it. I enjoy creating a plan and timeline and just the simple action of crossing an item off my list gives me a sense of pleasure. I try to be productive, but I also really enjoy my down time and enjoying the simple pleasures of life. I notice funny details and relationships that other people often bypass, and as a result I tend to have a deeply internal, dry sense of humor. I don’t usually share this with others unless I know them well, but once I trust someone I tend to surprise them with the funny things I observe throughout the day. I can also be extremely sarcastic, but a lot of the sarcasm remains in my head. If I commit to someone, whether it’s a friend, family member, or spouse, I’m there for the long haul. My word is my bond and I don’t give it lightly. For this reason it’s a major pet peeve of mine when other people are wishy-washy with their words and promises. Some type descriptions make us sound like we’re averse to anything new and unusual. This isn’t true, but we do like to see that something consistently works and we like to test and retest methods to make sure they are reliable. We take our time to subscribe to a new theory or idea because we’re very meticulous about making sure the idea actually works in real life. When it comes to decisions I try as hard as I can to make sure I’m not letting personal bias or prejudice shape my opinions and decisions. I try to step out of a decision to consider all the facts, the proven truths, the pros and cons, and the most logical solutions. Fairness is very important to me and I strive to make sure I’m not letting emotions cloud my judgment. To some people, this makes me appear cold, but it’s really my way of making sure I’m not taking sides or being unrealistic.